Anyone who owns an undeveloped acre or more of land can establish a forest conservation bank in Montgomery County. An already established forest may be protected or a new forest can be planted. These forested areas are permanently protected by a Conservation Easement Agreement. A forest bank must be at least one acre in size. Newly planted forest banks may be created and are strongly encouraged within sensitive and undevelopable areas as defined in the Forest Conservation Law Section 22A-12(e)(5). A bank may be created by protecting a forest that is already established. However, the forest must include significant upland areas along with sensitive area such as floodplains, wetlands, steep slopes. The forest may not be located in primarily sensitive areas that are not conducive to agriculture and with no development potential, and therefore not threaten. In addition, the forest within the proposed bank must be in reasonably good condition. For instance, a forest that is overgrown with invasive species would not be accepted as a bank unless invasive treatment was part of the bank proposal. Forest planted in excess of forest conservation plan requirements may be banked. Forests that are planted using funds or other incentives from other state, federal or local programs such as CREP and Stream Releaf may not become part of a forest bank. A forest bank must be in reasonable condition to be approved. For instance, a forest that is overgrown with invasives species would not be approved without remedial treatment. A planted forest must have an approved planting plan that includes a variety of native species, proper planting methods, deer protection and a two-year maintenance program. All forest within the Bank area must be permanently protected by a Category I Conservation Easement. This easement agreement is recorded in the land records and subject to periodic inspection for compliance with the agreement. The bank area must also have signage indicating that the area is permanently protected in a forested condition. The Category I Conservation Easement, used to protect Banks, may not overlap with other easements such as for utilities, storm drain, and stormwater management. However Forest Banks may overlap with easements that are used to preserve agriculture in Montgomery County. It is the responsibility of the property owner to ensure that the holder of the Agriculture Easement also allows the Category I Easement to overlap. Overlapping the easement is permitted, but Bank value may be affected, depending of the type of easement and other circumstances. Credits may not be sold from a planted bank until there have been two years of successful management. If the bank summits a two year performance bond, credits may be sold as soon as planting is completed and inspected for quality. 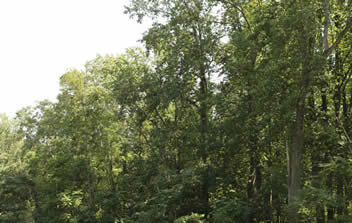 The plantings must remain in good condition during the time that forest credits are being sold. The Planning Department may withhold approval of bank transactions if the condition of the forested area deteriorates to the point that it is no longer considered a forest. To establish a forest conservation bank you must first comply with the NRI FSD Conservation Bank Submission Requirements. Click here for the NRI FSD Conservation Bank Submission Requirements document. Once the Forest Conservation Bank Plan has been approved, a Category 1 Easement Agreement is recorded over the forest area. Click here for the Category 1 Easement Agreement document. These forms and others are found at the following webpage. 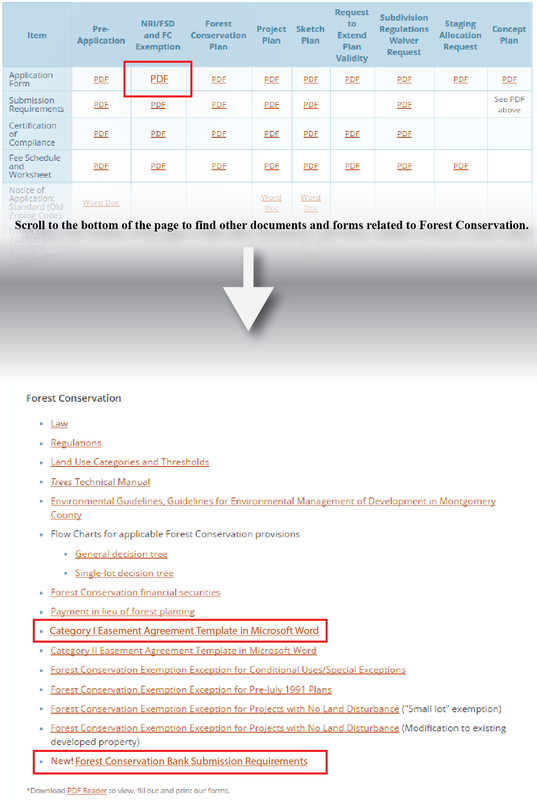 Scroll to the bottom of the Application forms webpage to find other documents and forms related to forest conservation.